Record Drop in Coal Burning Raises Question — Is Peak Fossil Fuel Use Happening Now? Peak oil, gas, and coal. It’s a possibility that many who believe the fossil fuel industry’s false dependency mantra look at with fear and trembling. Because, for years, that industry, through various public relations efforts, has perpetuated a myth that a loss of access to fossil fuels would ruin the modern global economy. That fossil fuels were so high-quality no other energy source could effectively replace them. It’s a myth that, in many ways, competes with the threat of human-caused climate change for space in the public’s collective imagination. One that is not without a few valid supports. For the shifting of energy use away from one set of sources and on toward another set is a massive, disruptive undertaking even in the case where the new energy sources are superior to the old. But despite a few reasonable worries, the overall effect is to generate a decoy existential threat to the very real threat of a new global mass extinction event if fossil fuel burning isn’t somehow halted in very short order. One that removes innovative thinking and generates a false impression that there really is no way to effectively mitigate and respond to the impacts of an ever-worsening long climate emergency. Climate change is among the greatest health risks of the 21st Century. Rising temperatures and more extreme weather events cost lives directly, increase transmission and spread of infectious diseases, and undermine the environmental determinants of health, including clean air and water, and sufficient food. At the same time, many of the same policy and technology choices that drive climate change, such as polluting energy sources and unsustainable transport systems, also have large immediate and local health impacts – most notably the more than seven million deaths that are caused each year by air pollution (emphasis added). Given what is a very real danger to human health and well-being arising out of the practice of burning fossil fuels coupled with potential human civilization collapses due to severe climate change, sea level rise, disruptions to the growing season, and extreme weather, it’s worth considering the notion that a functional world without them is not only possible — it is absolutely necessary. For shift away from what some have called energy sources from hell and we open up the potential to expand prosperity, to increase prospects for not just the rich, but for practically everyone. For by doing so we shift away from fuels that result in severe systemic harms in a transition to new, less damaging, more distributed and democratic fuels. And with a massive curtailment of coal energy use, with a rapidly growing adoption of renewables, and with increasing challenges to growth in natural gas and oil consumption all showing up during 2015, it appears that just such a shift may have already started. Today’s harbinger of what may well now be an ongoing massive move away from harmful fossil fuel energy is itself a bit ironic. For the message comes in the form of a new report out from the fossil fuel giant British Petroleum. And it’s a real eye-catcher. For this fossil fuel industry based report found that global coal use fell by the largest margin ever recorded. With oil and gas struggling to make up the difference, with the fortunes of renewable energy on the rise, and with fossil fuel energy use growing at a very sluggish net annual rate of about 0.56 percent, we’ve got to ask the question — have we reached the age of peak fossil fuels? And, if so, why isn’t the world economy falling apart as some predicted? The big shock comes in the form of a massive 1.8 percent annual drop in coal use globally. Lead by China and the US, total global coal curtailment reached 71 million tons of oil equivalent during 2015. This was the greatest single annual drop in coal use in the entirety of the 50 year BP record. The massive drop in coal also occurred at a time when prices for the carbon-emitting commodity were at or near historical lows. A situation that would normally stimulate demand — all other things being equal. But with coal, all things are not equal. China suffers from some of the worst air and water pollution conditions in the world due to its reliance on the stuff. Its people are getting sick from emissions particulate related lung damage and from coal-based water contamination. Many are dying prematurely as a result. And since coal use is the greatest contributor to China’s air and water woes, China has undertaken a massive effort to curtail its burning. Globally, coal is also the worst fossil fuel contributor to Earth System warming on a pound-burned for pound-burned comparison. With global temperatures now hitting near the 1.3 C above 1880s temperature marks on an annual basis — a level high enough to begin to inflict severe climate change related harms — world leaders are increasingly feeling the heat to cut coal. Curtailment of coal use on such a large scale due to climate, health, welfare, and environmental concerns is unprecedented. In the past, large drops in coal use have only occurred during times of economic recession or when another major fossil fuel source such as natural gas out-competed coal on the global market. During this year of greatest coal losses, neither was the case. Coal remained competitive with natural gas on a cost vs cost comparison basis during 2015 even as the global economy grew by about 3 percent according to International Monetary Fund estimates. Coal’s loss also comes in the context of a declining fossil fuel share in the global energy mix. According to BP, fossil fuels accounted for only 86 percent of global energy use — which was the lowest level ever recorded. Non fossil fuel interest sources such as the recent REN21 paper on the global state of renewable energy put that number even lower — close to 80 percent. 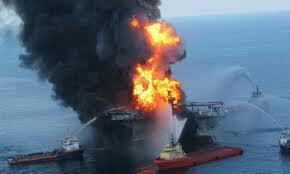 But the BP numbers look bad enough from the fossil fuel industry perspective. Globally, both gas and oil use increased by a combined 134 million tons of oil equivalent. A gradual rate of growth that follows historical lines for those two sources. However, when you account for the loss of coal, net fossil fuel energy use only grew by 63 million tons of oil equivalent — and that represents just a 0.56 percent annual rate of growth for the fossil fuel sector. This compares to a historical annual growth rate in fossil fuel use of 1 to 3 percent during non recession years. Rising rates of renewable energy adoption are the primary reason for coal’s fall and fossil fuel stagnation. Globally, according to BP figures, the net add in non-hydro renewables energy use was equivalent to 48 million tons of oil. A number that, if BP is correct, is nipping away at fossil fuel market dominance by achieving a rate of adoption similar to that of a mainstream energy source. Falling rates of overall energy gain for fossil fuels may well represent the start of a period when oil, gas, and coal begin to go into net decline. This has not happened yet. But it will be necessary if the world is to have much hope of preventing extremely catastrophic rates of warming by greater than 2 C above pre-industrial levels this Century. So the big coal curtailment during 2015 as the global economy continued a 3 percent annual growth rate was a huge step in the right direction. But to prevent a future in which ever-more-harmful rates of warming occur. In which 3 C, 4 C, or even 5 C warming becomes likely during this Century, then we will need to continue seeing renewables advance. Then we will need to see what would be a benevolent peak in fossil fuel use. One that is coming on a bit late for comfort and that couldn’t happen soon enough. 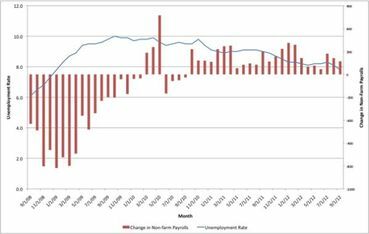 7.8% Unemployment and Falling: So Why are Republicans Selling Another Economic Decline? Confidence. It’s a funny game, isn’t it? And the most prominent con-game going on right now is this endless selling of economic decline. ‘The economy is bad,’ we hear. ‘The recovery wasn’t fast enough,’ they say. ‘Obama failed’ — and that’s the real message they want you to believe. They want you to believe that you’re miserable, things are terrible, and that the person to blame is Obama. They want you to believe that things are as bad as … well… as bad as four years ago. Perhaps the clearest illustration of this illusory sales pitch was when its very premise was threatened by a drop to 7.8 percent unemployment, putting a cherry on top of the strongest sustained jobs growth since 1984. These rosey facts led GOP magnates like Rick Satelli and Jack Welch to assert there was a ‘government conspiracy’ to fudge the numbers. And since employment figures are as closely guarded as US nuclear weapons codes, these assertions were quickly proven to be what they were: preposterous. It’s a chancy game, this selling of recession. Because the sales pitch itself creates a certain amount of damage. If people believe it, it suppresses economic confidence. It prevents people from buying. It may prevent some from seeking a job they would otherwise qualify for. It creates a kind of sense of malaise so poisonous to a post-recession expansion. Yet this selling of recession hasn’t only been verbal. It has been legislative. Every bill that would have actually resulted in jobs creation has been blocked by republicans in Congress for the past two years. The method Republicans have used to block all jobs legislation in the past two years is the same. A jobs bill comes up, it is filled with positive things for the economy, Republicans filibuster debate, this shields them from having to make floor speeches on why they don’t want tax breaks for small businesses… etc. Why? Well, if the economy recovers too strongly before an election, Republicans will lose power. We know republicans would have preferred to let GM go bankrupt, as Romney once advised. Now they attack an American innovation marvel. One that is leading an electric vehicle charge that could break the back of fossil fuel dependence and spur the American economy to new growth all in one go. Just last month, nearly 6000 electric vehicles sold in the US. Given these numbers, it appears that EVs are taking off even faster than their predecessor, the hybrid. Meanwhile, US alternative energy production has doubled since Obama took office. Sadly, the sales pitch of ‘recession’ continues. In just this past week’s debate Mitt Romney chided Obama for investing 90 Billion in green energy. That 90 billion included the stunning success the Volt is now becoming, in spite of a right-wing media assault. That 90 billion included a doubling of US renewable energy production. That 90 billion helped to support hundreds of thousands of jobs in places like Ohio, Wisconsin, Michigan, Florida, Texas and New Jersey. That 90 billion helped to indirectly support 8.5 million jobs that result from alternative energy — a number three times higher than that supported by fossil fuels for each dollar spent (Business Week). Yet all Romney could say for this emerging American revolution? 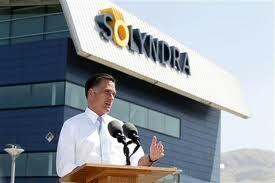 Solyndra. The cherry picking of one failed company in a wave of overall success. I suppose Romney could have thought of better use for that 90 Billion? Funneling it into a 5 trillion dollar tax cut for the rich, perhaps? Or, maybe investing it in ‘nation building’ overseas, as he mentioned recently in a foreign policy speech at VMI. But, under Obama, that money, instead has been invested in nation building at home. 7.8 percent unemployment and falling… Stock market doubles. It looks like a little nation building is making things better. Far better than when Bush left office at 7.8 percent unemployment and rising at the rate of 750,000 jobs lost each and every month. So what’s Romney’s big beef with building up America for once? Why keep bashing her? I don’t know if republicans, overall, are good or bad people. I suspect that they are good, just misled by misinformation and succumbing to that all-too-human failure of believing that the ends justify the means. But, just like Mitt Romney, they seem to be decent folk employed in the bad work of short-selling America. And it is this bad work that is so very unhelpful and destructive. The defending of tax cuts that aid in the shipping of jobs overseas. The defending of the dominance of the oil, gas and coal industry, which staunches future energy development, jobs growth, and prevents the tackling of the farmland-destroying menace that is climate change. What this reveals is that republicans have taken the cynical approach of hurting America in the hopes that it will aid them in the regaining of power. This ‘conquer America’ strategy through a systematic damage to America’s prospects would be something expected from a foreign power seeking to undermine America’s status for the advancement of its own. But it is a terrible betrayal for such a policy to be leveled against America by one of its own political parties. One that prides itself on its patriotism. For republicans, it is best to learn that, sometimes, it is better to lose for the right reasons than to win for the wrong ones. For winning the wrong way often results in a short term gain at the expense of a later consignment to the dust-bin of history — not to mention the terrible damage that occurs along the way. Message to Romney and republicans: stop doing bad work. Stop selling America short. Stop selling recession in the midst of recovery. Stop assaulting the new industries that will create the new jobs. Stop attacking American innovations like the Volt. Stop holding back legislation that helps people find work and helps build jobs. Stop making it harder on farmers and the people who tend to the engines of democracy — the hard-working people of America. Stop hurting us. Stop hurting America. And to Americans tired of this endless selling of recession, the sandbagging of US jobs progress, the destruction of emerging US industries, and the failed policies that caused our terrible recession in the first place: you have both the ability and the opportunity to remove these republicans in Congress and to prevent them from holding the White House again this November. Who knows, perhaps the time is right for a voter revolution against a harmful party, that acts so much like a foreign power, occupying our golden shores. Are Renewable Energy Sources Set to Outcompete Fossil Fuels? In short, the ‘new future’ looks a lot like the old past, but much more expensive and coming on the heels of a long string of global warming impacts. For gas, the cost of the tight sources is over twice that of traditional wells, costing around $5 to extract a unit of tight shale gas. For oil, tight shale supplies require as much as $90 dollars per barrel to produce. These high costs are nearly twice as much as the often derided and vilified ethanol, which requires $50 dollars per barrel to produce without subsidy. But the massive oil and gas marketing campaign to put out renewable energy’s electric fire continues apace. This week showed a flurry of glittery and optimistic oil and gas reports coupled with the typical volley of hit pieces aimed at everything that replaces oil from the Chevy Volt to your friendly neighborhood wind farm. The usual suspects all repeated their shrill and desperate chant of ‘the Volt is dead’ a month after Volt sales reached new records and costs to produce each vehicle were dropping fast as sales numbers increased. Misinformation painting the Volt as uneconomic was belied by these numbers and a recent report showing that the Volt only costs consumers 3 cents per mile to drive. A regular ICE vehicle at $4 per gallon gasoline and 30 miles per gallon fuel efficiency costs 13 cents a mile to drive, more than four times as much. How does the Volt achieve such a feat? Get rid of as much oil input as possible and move to a, far more efficient, battery and electric motor configuration. Perhaps these lower costs are the reason owners rank the Volt highest in customer satisfaction. The Volt is dead! Long live the Volt! But despite all the positive attributes of this powerful, new American technology, a large section of the media is now bent on killing the vehicle. At every success a new negative spin is generated. For example, as the Volt broke sales records last month, hundreds of blogs and articles parroted the fact that GM was offering discounts on the car as a sign of weakness. The same papers and blogs, many months before, criticized the Volt for being too expensive. So which is it? Similar negative information has been spewed about wind, solar, and biofuels. The only solution heralded by these ‘news’ sources appears to be fossil fuels, whose rather large and long string of negatives these news sources wholly ignore. Which ultimately begs the question, who pays the check? Attempts at fossil fuel dominance and public opinion shaping ranged long and far throughout traditional media and in politics. Overall, it was a typical, banner week for the increasingly rickety fossil fuel based economy. But despite all this misinformation which one blogger recently to compared to the reign of ‘the Dark Lord,’ there were a number of glimmers of hope peaking out through all this misinformation. As mentioned above, Chevy recently discounted its revolutionary Volt by as much as 10,000 dollars or offered leases for $299 (not $159 as claimed in the misinformation media), spurring new sales and raising the possibility that total Volt sales would reach 30,000 by end of September. Overall, this is far better than the earlier launch of the, equally derided and vilified at the time, Toyota Prius during its first two years. In addition, even as prices for the Volt are going down, quality is going up. The EPA estimated battery range for the vehicle has climbed from 35 miles to 38 miles resulting in a combined average mileage of 98 mpg. This gives most Volt users about 1000 miles of travel between fill-ups which means savings on top of savings for owners. In addition, US alternative energy coming from solar, wind, and geothermal, as a percentage of electric power, has grown from 3% to 6% within the last four years. Total alternative energy from electric power adding in hydro-electric and geothermal is now over 15%, more than nuclear energy as a proportion of electricity generation. And since the primary contributor to greenhouse gas emissions is electricity generation (coming from coal and natural gas generation and extraction), this leap in alternative energy capacity is a help in dealing with the problem of climate change. Perhaps most important is level costs and falling prices. Wind and solar energy are very stable energy sources, making it easy for investors to predict outcomes. Not so with natural gas, which is one of the most volatile energy sources available, making it a baby for those who love to game the market. And as time has gone forward, costs for wind and solar continue to drop. Wind is now less expensive than everything but the least expensive natural gas plants. And solar is now less expensive than new nuclear energy and combined cycle gas and coal plants that could be retrofitted for carbon capture at even greater prices. In fact, over the past 18 months, the cost of solar panels has dropped by 65%, leading to a boom in panel sales around the world and in the US even as modest subsidy support for the new energy sources may be withdrawn. The same can certainly not be said for fossil fuels. Natural gas is driving some companies to the edge of bankruptcy due to the rising cost of extraction and a glut on the market, caused, in part, by rising alternative energy usage. In addition, oil just saw its most expensive year on record. And people are beginning to awaken to the vast external costs and harm of coal use, with opposition to new plants rising in the US and around the world. 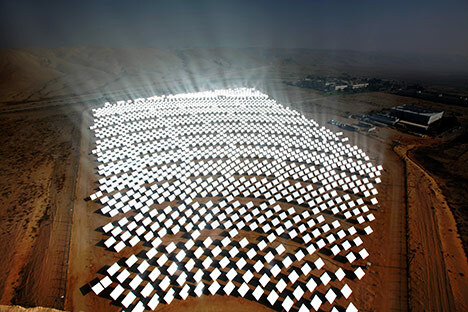 Across the globe, countries are taking notice of the alternative energy sea change. During a period this spring, Germany produced 50% of its energy from solar panels. That number is expected to rise to as high as 70% by next year. And as one of the only bright lights in Portugal’s ailing economy, it has managed to install enough renewable energy to make up 45% of its entire electricity grid. Going forward, this energy capital will help to stabilize and improve an otherwise troubled economy by reducing its dependence on imported fuels. Similar stories are being told across Europe and in places in the US. North Dakota produces 20% of its electricity through wind. California and Texas are following suit. 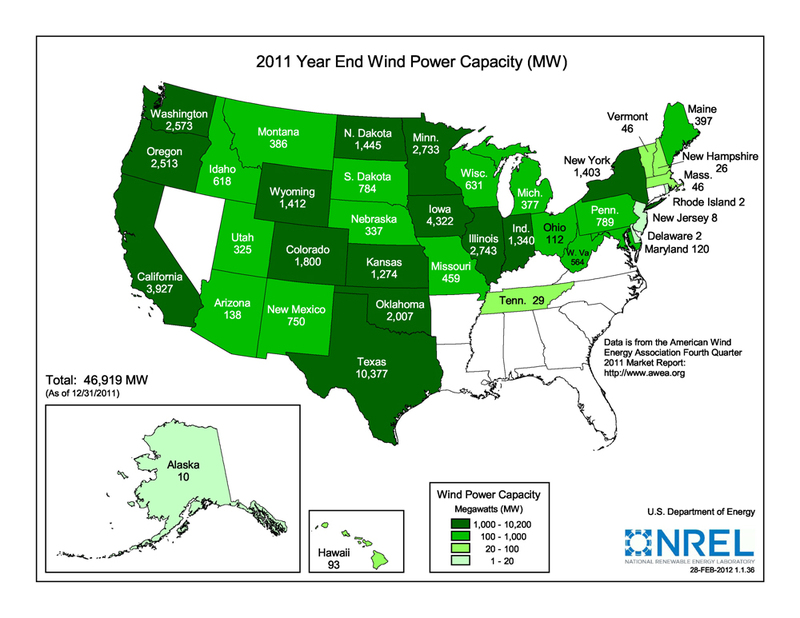 A view of the total installed capacity for US wind energy can be seen below (As of August 2012, the number broke 50 gigawatts installed, a 3.1 GW addition in just 8 months!). The EU has installed 100 gigawatts of wind capacity and China boasts over 60 gigawatts of installed wind energy capacity. In total, nearly 50 gigawatts of new wind energy capacity will be installed during 2012. Solar energy is now surging to catch up, with total solar energy installations to reach 30 gigawatts in Germany alone this year. The US now boasts 6 gigawatts of solar energy and growing and the world is now adding nearly 30 gigawatts of solar energy capacity each year. This combined installation of 80 gigawatts wind and solar each year is a significant leap forward for alternative energy and is starting to prove its ability to outpace fossil fuels as a primary energy provider. A sad fact is that, without the harmful media and political campaign being waged by US oil, gas, and coal special interests, the US could be even further along in developing domestic energy sources independent of foreign influence or climate damaging pollutants. 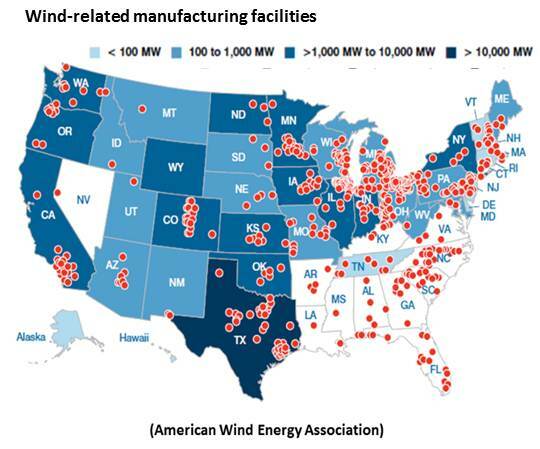 Recent opposition to the production tax credit by oil money soaked republicans in Congress now threatens thousands of US alternative energy jobs and will likely further slow development of wind and solar energy production capacity within the US. This removes a key feed-in to US manufacturing and cedes more leadership to competitors overseas — primarily Europe and China. But the republicans, who run on the false mantra that they believe all ‘government subsidies are bad,’ never saw a fossil fuel subsidy they didn’t like and are fighting tooth and nail to keep the oil and gas industry’s incentives of 40 billion dollars intact even as they campaign on expanding subsidy support to this already subsidy bloated industry. But the republicans have been unable to stop what is a growing US and world-wide trend, only delay it, much to the harm of their native country. All these facts combine to make the alternative energy sector a growing challenge to the established fossil fuel special interests. And, for this reason alone, we are likely to continue to see a stream of misinformation and demonization of the alternatives coming from fossil-fuel associated sources. But the next time you hear someone say the words Solyndra in a political context, bash wind or solar, or demonize the Volt, it’s important to know where that message originated — those casting their lot with the dirty, dangerous, and depleting fossil fuels.